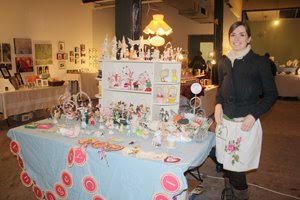 It was a bright and chilly New England afternoon on February 6th when 18 exhibitors from Boston Handmade arrived at 31 Thayer Street in the SoWa gallery district of Boston's South End. 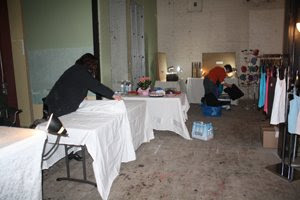 Our mission was to transform a giant, empty space with no lighting fixtures into a warm and inviting Valentine event as part of the monthly First Fridays Open Studios. We were embarking on our 2nd Annual Be Mine Valentine Show! 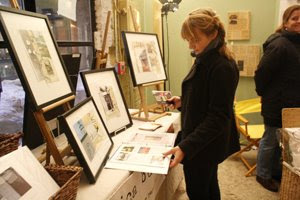 In just 2 short hours every one had arrived, set up their displays, decorated the space, posted signage on the display windows, and managed to light the entire 3000 square foot room with a menagerie of photo flood lights, construction lighting, lamps from home, exposed bulbs, reading lamps, and strings of holiday lights. The effort was monumental, everyone helped their neighbor, and the result was a beauty to behold! For our event attendees we provided a spread of Valentine themes refreshments - everything from heart shaped cookies, to chocolate kisses, to candy hearts. 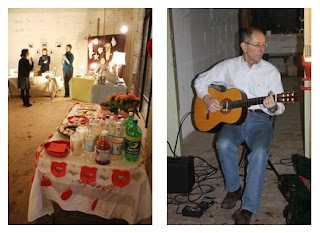 We also were thrilled to have live music throughout our entire event provided by exhibitor Jen Paulousky's Father, Peter Paulousky. What a delight! 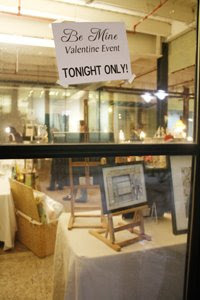 Once the doors were opened we were filled all night with visitors browsing our work and purchasing Valentine gifts for their loved ones. 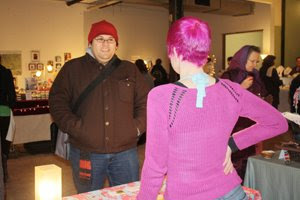 We even had a Craft Celebrity sighting when Guido of It's A Purl Man stopped by for a visit. 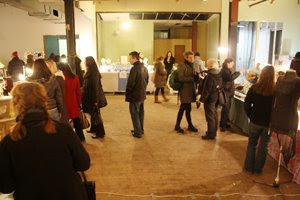 For our first time exhibiting as part of this South End monthly event we were truly thrilled with the attention we received and all of the amazing positive comments we heard about our work on view, and about the event overall. We couldn't have produced this show without the generous support of John Kiger and GTI Properties. Thank you! 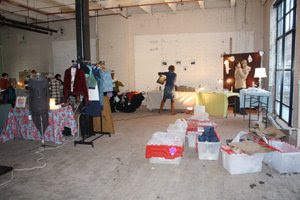 The event was a great experience for us and we hope to have the opportunity to show again in the neighborhood sometime soon! 'Till then, we'll see you on the blog.